Hernandez will pitch Monday in a minor league game in Peoria. He's expected to throw 45 pitches. PEORIA, Ariz. — Following Felix Hernandez’s 38th and final pitch of his bullpen on Friday morning — a crisp fastball in the bottom half of the strike zone that resulted in an echoing pop from the mitt of catcher Tuffy Gosewisch — the crowd of about 40-50 people watching nearby celebrated what they’d seen with a polite, but loud ovation. Ever the entertainer, Hernandez acknowledged the clapping fans and grabbed at the bill of his hat in salute. “A pitcher gets a standing ovation for a bullpen?” Gosewisch remarked to former Mariners pitcher Joel Pineiro, who has been in camp for a week as a guest coach. “That pitcher does,” Pineiro said. It’s almost surprising that manager Scott Servais and pitching coach Mel Stottlemyre, who were watching closely, didn’t also applaud with the fans. They were that pleased. Uh, Felix, today is Friday, and you are scheduled to start Monday. Most people chuckled and shrugged their shoulders at his confusion. It’s easy to get lost the sameness of each day during spring training. The “Groundhog Day” effect can be even more pronounced when you are rehabbing an injury. Officially, Hernandez is scheduled to start in a minor-league game on Monday. James Paxton will also start on that Monday in a minor-league game instead of facing the Angels in Tempe. The Mariners’ minor league teams play the Padres’ minor league teams that day with the Class AAA and Class AA teams playing on the San Diego side of the complex and the High A/Low A teams playing on the Seattle side. The Mariners haven’t announced which specific game either pitcher will start. The plan is for Hernandez to throw three innings and around 45 pitches. In a minor league game, teams can “roll” or end an inning if a certain pitch number is met without getting three outs. 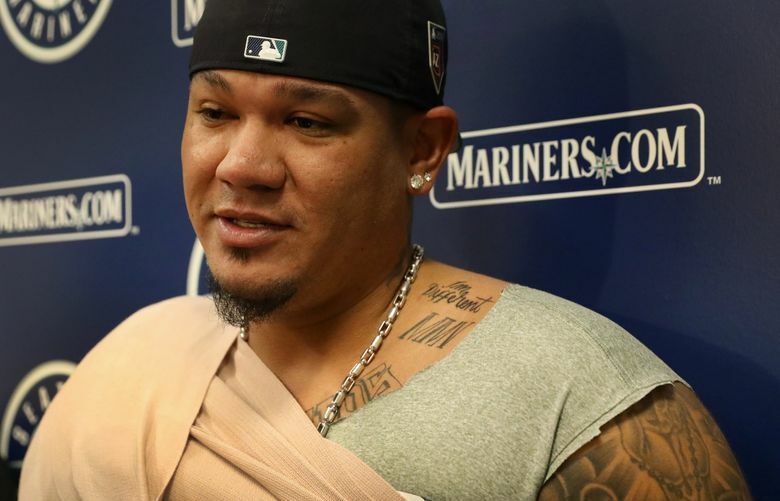 It’s a more controlled environment, which is what the Mariners want for Hernandez. One thing that was noticeable in his last two bullpens and the very brief time he was on the mound in his first start of the spring, before he got smoked by that line drive off the bat of Victor Caratini, Hernandez has made some adjustments to his delivery from the full windup and stretch. It’s very noticeable in the full windup. After Hernandez steps to the back and left of the pitching rubber with his left foot to start the wind-up, he pauses there and gathers himself for a moment or two before re-starting his delivery. It’s mildly similar to the delivery of Giants’ starter Johnny Cueto. *** Shortstop Jean Segura returned to the lineup on Friday after exiting Wednesday’s game with hamstring tightness. There certainly seemed to be no issues as Segura had three singles in three at-bats, including a two-run single in the second inning. Ichiro (calf tightness) didn’t participate in the team workout, but did individual agility work and running in the outfield on his own. He’s expected to play on Sunday or Monday. Robinson Cano (left hamstring strain), Nelson Cruz (right quad strain) and Andrew Romine (left shoulder partial subluxation) will likely return to game action after the Tuesday off day, if not before. *** Even with all the injuries, Servais wasn’t afraid to take a few minutes to acknowledge a young fan. A 5-year-old boy named Ethan, who was clad in a Kyle Seager jersey and there with his father, stood by the fence holding a baseball and pen looking for autographs. Instead, he got a tour of the facility, the chance to meet several players … and their autographs. With a nod from Ethan’s father, Servais took the young fan around the complex. Ethan first met Felix Hernandez, who was walking out to throw his bullpen session. Hernandez signed his baseball and then talked with Ethan for a few minutes. The next introduction and autograph came from hitting coach Edgar Martinez, who also posed for a picture. Servais then took Ethan into the facility where he met Nelson Cruz and Robinson Cano, who were rehabbing the Mariners pool. “I think his dad was a little jealous,” Servais said.